SHANGHAI, Apr 16, 2018 - (Media OutReach) - The Asia Pacific region's booming economy looks set to power global trade growth in the coming quarter, according to data from the DHL Global Trade Barometer released by DHL, the world's leading logistics company. The DHL Global Trade Barometer, an early indicator of global trade developments calculated using Artificial Intelligence and Big Data, predicts an overall positive outlook for all four of Asia's largest economies. "Asia's economies are clambering towards new levels of growth not seen in recent times," said Kelvin Leung, CEO, DHL Global Forwarding Asia Pacific. "The DHL Global Trade Barometer's latest findings highlight that Asia's trade fundamentals - and indeed those of its biggest trade partners - remain robust enough to warrant optimism in the near-term, particularly those industries directly involved with manufacturing and production for the region's burgeoning consumer base." China's imports and exports of industrial raw materials both saw major increases in March, buoying the country's ocean and air freight volumes for the quarter. At the same time, other sectors like high technology and consumer fashion are expected to decline in the next three months - but not for lack of domestic demand. "We've begun to see the effects of 'Made in China 2025' on China's trade footprint, driving up production of high-tech goods locally at the expense of imports," said Steve Huang, CEO, DHL Global Forwarding Greater China. "We can expect sectors like information technology, robotics, and biopharma - along with more prosaic items like personal and household goods - to experience a relatively rapid shift into net export territory, alongside a continued rise in imports of the raw materials necessary for production." The Barometer's results also suggest that South Korea and Japan are on track for significant acceleration in trade growth, even as India and China maintain some of the highest growth rates amongst the world's largest economies. Strong growth in ocean freight across Asia Pacific, coupled with steady or rising air freight traffic in the region's bellwether economies, appear to be driven largely by rising trade in industrial raw materials, capital equipment, and machinery - potentially foreshadowing an extended period of development for Asian infrastructure, manufacturing, and domestic consumption. 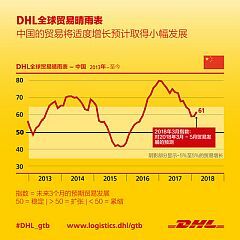 "The DHL Global Trade Barometer's latest results reveal that economic growth and connectivity have maintained a strong upward trajectory despite any global uncertainty around free trade," said Leung. "It also emphasizes just how interconnected Asia's economies are to the rest of the world. For the region's growth to continue, its logistics and freight infrastructure must not only provide reliability under all conditions, but also cater to an increasingly diverse range of industries with fluctuating levels of growth." Developed jointly by DHL and Accenture, the DHL Global Trade Barometer provides a quarterly outlook on future trade, taking into consideration the import and export data of seven large economies: China, South Korea, Germany, India, Japan, the United Kingdom, and the United States. Together, these countries account for 75 percent of world trade, making their aggregated data an effective bellwether for near-term predictions on global trade. The DHL Global Barometer, which assesses commodities that serve as the basis for further industrial production, predicts that global trade will continue to grow in the next three months, despite slight losses in momentum.